Lieutenant Carl Frederick Geissler served on the USS Achernar (http://en.wikipedia.org/wiki/USS_Achernar_(AKA-53)). When Geissler first arrived at the Naval training center in Chicago, they lined up all the recruits at the deep end of a huge Olympic sized pool saying, “If you can make it to the other end of the pool somehow and not drown, then you’re in the Navy,” and then they pushed them all in. Geissler said “I don’t know how to swim, just how to dog paddle,” but he made it to the other end! 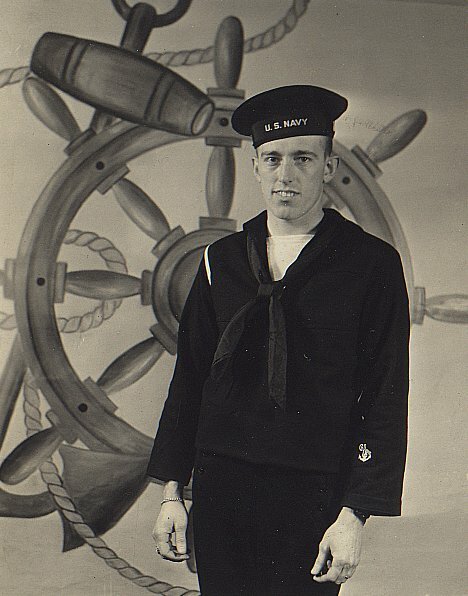 Once he was in the Navy, someone found out that he had a degree from University of Illinois. He applied for officer’s status and was assigned the rank of Lieutenant Jr. Grade. He said it was really awkward having to salute officers one day and the next day other soldiers were saluting him! Lieutenant Geissler’s leg received shrapnel from the explosion, and he was awarded the Purple Heart because of the wounds. Since other sailors lost their lives, and he was one of the officers on duty at the time, he felt guilty about receiving the Purple Heart. Carl blamed himself for not shooting that last plane down in time. Because the ship was listing, they had to tilt it sideways in order to keep it from taking in water during repairs. When the battle was over and because Lieutenant Geissler was an officer, he was able to go ashore and look at all the weapons they found in Okinawa. They were each allowed to take one item, and Geissler took a sword painted brown (perhaps painted for camouflage). The Achernar remained at Okinawa for several weeks, when she sailed for the United States via Ulithi and Pearl Harbor. Achernar and Lieutenant Geissler then shuttled personnel and equipment between Japan, various other Pacific islands, and took part in “Magic Carpet” operations, returning veterans to the United States. Achernar received three battle stars for World War II service. Carl didn’t like talking about the war; he said it was a terrible thing and he got off lucky.